Contegra’s STATION MASTER 703 controller is an Easy-to-See and Easy-to-Set (EZ2 See/EZ2 Set™) automatic triplex pump control and alarm monitoring system that provides triplex pump control with an intuitive, easy-to-use graphical user interface. 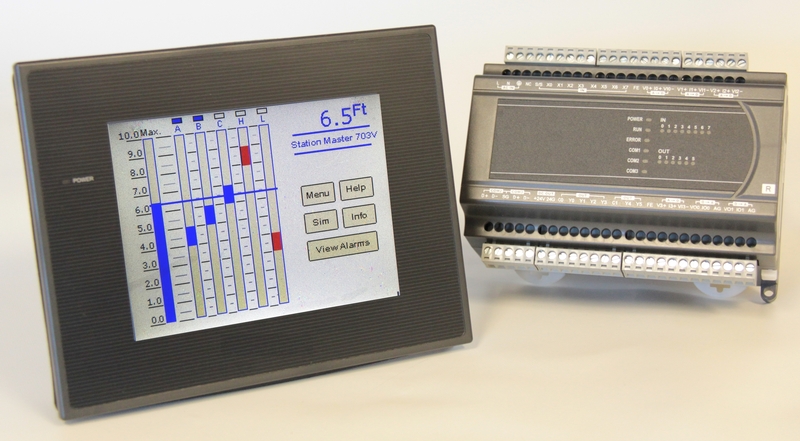 The STATION MASTER 703 controller is ideal for sewage lift stations (i.e. Pump-Down applications) or water systems (i.e. Pump-Up applications). The EZ2 See/EZ2 Set™ interface makes installation and operation a simple process. The graphical display shows the current tank level, pump 1, 2 and 3 on/off setpoints, and the high and low alarm setpoints. Underlying screens allow the operator to adjust the pump and alarm setpoints, select alternation sequences review alarms and configure the controller for the specific application. The adjustments are easily accessed through the HOME screen’s columnar display or by means of the HOME screen’s MENU pushbutton. The DIN-rail-mounted IO Module is typically mounted on an enclosure’s inner panel. The module’s relay outputs provide control for the three pumps and several selectable alarm points. The module’s selectable inputs include pump running, pump unavailable, pump no-flow, control inhibit, external alarm acknowledge, pump over-temperature, pump seal-failure, generator running, and alarm acknowledge . The IO Module’s 12-bit analog inputs accept both a primary and secondary (optional) process level sensing input and an analog signal for a flow sensor (optional). In pump-down applications the SM703V provides VFD control by means of an analog outputs which is used to modulate the VFD’s speed . The controller’s second analog output follows the process level over a 0-100% excursion. The TouchPoint™ operator interface leads the operator through the setpoint and configuration selections. The features include setpoint adjustment, convenient selection of the pumping order, pumping direction (i.e. Pump Up/Pump Down), and numerous other easily understood and readily accessible features. This “guided tour” of the controller’s features makes operating the controller as easy as touching the desired setpoint or adjustment and changing the respective setpoint. With the STATION MASTER controller’s sealed front cover there are no programming switches to move or jumpers to lose. The interface makes setup, adjustment and confirmation of the controller’s operating parameters EZ2 See/EZ2 SetTM. The controller accepts analog inputs ranging from 4-20 mADC or 0-5 VDC. The Station Master 703 controller is able to easily scale either a calibrated (i.e. 4-20 mADC over 0-10’ excursion) or an uncalibrated input . Whether dealing with a new installation or retrofitting an existing site, the Station Mater 703 controller provides outstanding control and alarm capabilities. The TouchPoint™ interface allows the operator to easily select 1st On/ 1st Off, Fixed, or Rotary alternation. All adjustments and setpoints are stored in permanent memory. The installing technician sets the controller’s operating range to a value up to a 100.0’ excursion. The Station Master 703 has an on-board audible. Several user-selectable alarm outputs are also provided. Manual level simulation allows the operator to test the controller’s operation and confirm the configuration. Pressing the SIM button activates level simulation. Simulation “safety” is an integral part of the Station Master’s control strategy. To prevent unauthorized changes to the system’s settings, the HMI’s setpoints and configuration adjustments are protected by multiple security levels. The Station Master 703’s inputs may be configured as either sinking (i.e. Pull down) or sourcing (i.e. Pull-Up). Analog input: 4-20 mA or 0-5 VDC input. The IO module provides 24 VDC for sensor excitation. Selectable Discrete Inputs: Pump 1, 2 or 3 Running, Pump 1, 2 or 3 Failed, external alarm acknowledge and controller inhibit. Discrete Relay Outputs: Pump 1, 2 and 3 Control and selectable alarm outputs. All relay outputs are normally open (i.e. open on power failure). Outputs 1-4 share a common return. Outputs 5 & 6 share a second common return. The relays are rated for 2 amps maximum per contact and a maximum of 5 amps per common. Externally the HMI is 5.7”H x 7.25”W x 1.7”D . The required door cutout is 5.2”H x 6.78W”. The IO module is 4” H X 6”W X 3.25”D. All wiring is terminated at removable terminal blocks. The SM703 includes the serial communication cable that provides communication between the HMI and the IO Module. Power: HMI— 24 VDC, IO Module — 120 VAC.